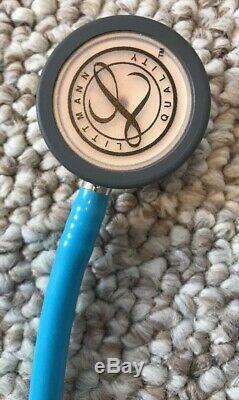 This stethoscope is gently used, ready for use, and works great. Below is from the manufacturers website. 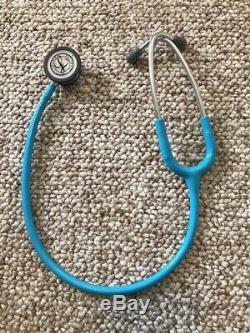 Here's what makes the Classic III stethoscope stand out. Pediatric side converts to an open bell. Just remove the single-piece diaphragm and replace it with a non-chill rim. Single-piece diaphragm is easy to attach and easy to clean because the surface is smooth without crevices. 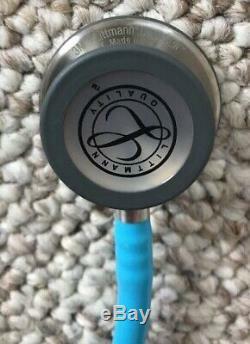 The bell of the stethoscope stays clean. Open bell stays clear of dirt and debris by covering it with the small diaphragm. 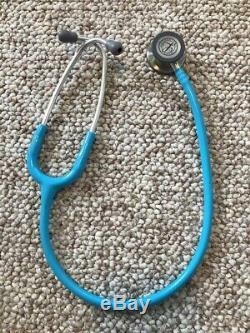 Stethoscope parts free from rubber latex and phthalate plasticizers. No natural rubber latex or phthalate plasticizers are used in the tubing or any other component. Monitor and assess a wide range of patients. Detect normal and abnormal sounds and rhythms. Useful in non-critical care environments such as a medical office, general ward, OB/GYN, ambulatory clinic or urgent care. Fun and vibrant; match color and finish to your personality. Designed for use with adult and pediatric patients. Tunable, dual-sided stainless steel chestpiece with open or closed bell. Non-chill bell sleeve for greater patient comfort. Soft-sealing ear-tips provide optimal comfort and excellent sound occlusion. Made in the USA without natural rubber latex. The 3M Littmann® Classic III Stethoscope is the latest version of the stethoscope that helps millions of medical professionals achieve their best. The Classic III stethoscope offers high acoustic sensitivity for exceptional performance, plus a versatile two-sided chestpiece with tunable diaphragms. 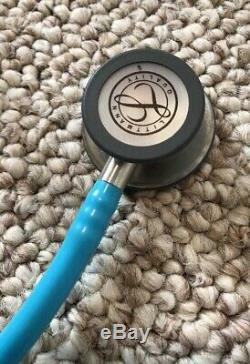 The Classic III stethoscope is used by students and medical professionals alike to identify, listen to, and study heart, lung, and other body sounds for physical assessment, patient monitoring, and diagnosis. Tunable diaphragm technologya 3M inventionlets clinicians hear different frequency sounds by simply adjusting the pressure on the chestpiece. Hold the chestpiece with light pressure to hear low frequency sounds; press a little more to hear higher frequency sounds. This time-saving feature allows the healthcare provider to focus on the patient, while the non-chill diaphragm provides patient comfort. 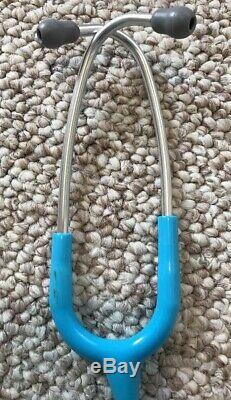 Headset tension is easily adjusted for head size and comfort by squeezing together or pulling apart the eartubes. Snap-tight, soft-sealing eartips conform to individual ears for an excellent acoustic seal and comfortable fit. Eartips snap firmly onto the ends of the eartubes and, for safety, require a significant effort to remove. 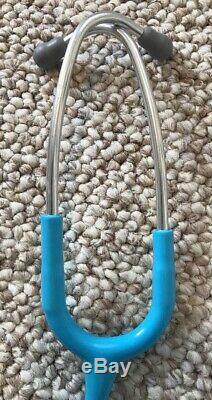 Resilient next-generation tubing retains its shape and flexibility even after folding tightly into a pocket. Next-generation tubing is not made with natural rubber latex, a benefit to sensitive medical professionals and their patients. And, to play its part in the protection of human health and the environment, the next-generation tubing does not contain phthalate plasticizers. The Classic III stethoscope is made in the USA for consistent quality. It comes complete with large and small soft-sealing eartips, non-chill bell sleeve, and instructions. General Physical Assessment and Diagnosis. The item "3M Littmann Classic III Monitoring Stethoscope, Turquoise Tube 27, inch, 5835" is in sale since Monday, March 11, 2019. This item is in the category "Business & Industrial\Healthcare, Lab & Dental\Medical/Lab Equipment Attachments & Accessories\Stethoscope Parts & Accessories". The seller is "catcher93" and is located in Saint Ann, Missouri. This item can be shipped to United States, Canada, United Kingdom, Denmark, Romania, Slovakia, Bulgaria, Czech republic, Finland, Hungary, Latvia, Lithuania, Malta, Estonia, Australia, Greece, Portugal, Cyprus, Slovenia, Japan, Sweden, South Korea, Taiwan, Belgium, France, Hong Kong, Ireland, Netherlands, Poland, Spain, Italy, Germany, Austria, Bahamas, Israel, New Zealand, Singapore, Switzerland, Norway, Qatar, Kuwait, Bahrain, Croatia, Malaysia.